The world is an ever-changing place. Some are good and some are bad. Thus is the way of things. For example, I was a kid when video games became popular and we even had an arcade in walking distance (at a time when parents didn’t freak if their kid left the yard…if they’re even that “brave”). I was a kid when home video game consoles were first being sold in stores, from the Odyssey II to the Atari 2600. I was a kid when home computers were first marketed to homes. My cousin had a Commodore Vic 20, my friend had the same kind of TRS-80 that was in the corner of our homeroom in school, and my dad eventually bought an Atari 800 where my mom schooled us in Ms. Pac-Man. This morning I took a walk since it’s good for my recovery and it’s unusually warm today. (It should be back to normal by the weekend.) In a case strapped to my belt was a device that was more powerful than all of those machines, can do everything those old machines can do and more, and was thinner than the manual for any of those devices. We are all now more connected than ever thanks to data plans, wi-fi, texting, and that rare moment someone actually makes a phone call. I still remember one day when I walked past someone talking to a friend on her cell phone in the days before smart phones, walked a little ways down and saw her friend as they were trying to find each other. (Of course I pointed her in the right direction. It still makes me laugh.) But in the days when the internet was just starting to exist and required a separate service that would tie up your telephone, people were still worried about what this brave new world would be like. Some people are afraid of it now as there are those who are more than willing to cause you harm in one form or another for their own benefit and amusement. 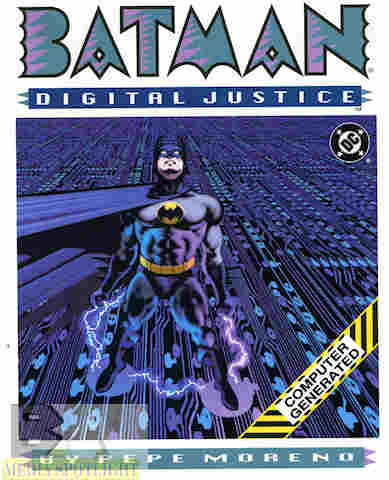 1990’s Batman: Digital Justice is a combination of Tron and Blade Runner, a predecessor or early contemporary of the rising “cyberpunk” movement of science fiction, where man and machine fought for control. And technology even played a part in its creation. While characters are drawn on the computer (long before programs were actually designed to make comics on the computer), 3D modelling was used for backgrounds and other imagery. It followed on the heels of Marvel’s gimmick of using a computer to create a comic, 1987’s Iron Man: Crash. While I have never read that comic, this one is more Tron that what I’ve read about it, while set in a computer-controlled Gotham City. But does Digital Justice go beyond the gimmick? Yes…until things get weird. The closest I could come to finding a computer drawing program called Anaya was a plug-in for Photoshop whose website hasn’t been updated since 2008. I know he made this on a Mac II. Computer geeks would find the full stats interesting, but there are better computer programs released for free now while most of the comic creators I know split between Photoshop and Clip Studio Paint (formerly under the more fitting name Manga Studio). But you’re here for a comic review, not a computer/art geek lesson. It’s the far future because of course it is. Gotham is run by a computer, the police are there for PR while flying servo robots do the arresting…or rather the killing. Officer James Gordon (the grandson of the Jim Gordon we know) is trying to be a good cop but the servos are acting oddly lately and murdering the suspects before he can arrest them. He senses someone is messing with the robots, but as usual the rabbit hole is deeper than that. (Actually I’m surprised “rabbit hole” isn’t used in this story…guess that wasn’t a clichéd term yet.) As he and his partner Lena investigate, he runs afoul of the people in charge: the mayor Madam X (speaking of clichés) and her three cyborgs that control the cops (Lawman), the media (Mediaman), and the criminals (Moblord, because I guess Mobman was too silly). And there’s her master, a living computer code that exists as a smile. Yeah, it’s the Joker. I could play with you, but any Batfan immediately knows it’s a Joker computer virus. Oddly enough the Joker actually did try a computer virus plot in the regular continuity but was foiled by Robin (Tim Drake at the time). As the officers did further they find someone has been messing with the servo robots. Not wanting his operation to be found out Joker Code starts making life difficult for Gordon, cutting every resource he can. Lena learns of secret telepresence communications but is killed “while making an arrest” according to the news man (or Mediaman more likely) and someone ransacks Jim’s apartment. While cleaning up Jim comes across an old Batman costume after finding a broken Batman statue in the park, probably decapitated by the Joker knowing him. With no place to go within channels, Jim decides to go outside channels by becoming Batman. While putting the heat on the criminals he comes under the notice of our little Illuminati wanna-bes. His adopted children also realize he’s Batman and his son Chang decides he’s going to be Robin, while his sister helps patch him up…and completely disappears from the story. She’s really kind of pointless. Jim’s boss grows a spine and tries to warn Jim that he’s been found out after an attempted assassination was foiled when something tried to take over the servo sent to kill him, but the Joker sends a deadly shock through his phone. Luckily, Jim and Chang are rescued by a car that I wouldn’t be surprised to learn was the inspiration for the Batmobile of Batman Beyond. It flies them to Wayne Manor and the Batcave, where they meet an old robot programmed to be Alfred and the computer with a digital version of Batman. When Bruce retired as Batman he prepared for the day that the world would go high-tech, and created a virtual Batman to fight on the digital plane, while the Joker has been cleared of creating a computer virus, which of course he totally made and has been slowly taking control of Gotham. While Batcode can fight the Joker on his own turf, he needs help to fight in the real world. Outfitted with upgraded Batman and Robin suites, Jim and Change prepare to do just that. Let’s pause for a moment and discuss the suits. I think the Joker virus is trying to stop me from making this review, since my internet cut out and everything went to crap for a few minutes. Anyway, the Batsuit. I actually like it. It looks padded, yet sleek and stealthy. The Batsymbol’s kind of lame, and Robin’s costume had more color when Chang designed his own, but the suit it cool. The headpiece is even what I was going for with the Reconstruction Zone Batman (I need to redraw that thing), as the helmet goes over the headcover and has night vision and other abilities we won’t see in this story. Then they go out and fight more crime, upsetting not only the Brain Trust but a singer named Gata that Gordon had the misfortune of meeting while he was still a cop, a Lady Gaga knockoff years before Lady Gaga started her gimmick. She rechristens herself Catwoman simply because she’s upset Batman is more popular than she is. Meanwhile, Batman and Robin split up; Batman takes down the Lawman while Robin handles Moblord. Batcode goes after Mediaman but is met by Joker Virus. The two battle, which Mediaman broadcasts…and it’s just series of zeroes and ones as they fight for control of the master computer (called Mastr because nobody read 1984 when they were creating this thing and only know the name Big Brother after the fact). Catwoman meets Batman and Robin at the door and challenges Batman to a fight to the death, upset that the cameras are not recording her rather than the virtual battle. This turns out to be a trick since the mayor put this together to capture the new fledgling Dynamic Duo, which Catwoman is not happy about. The three are led into the Mayor’s office…and that’s when the story jumps at least three different rails. The mayor has a digitizing machine because of course she does and forces Batman into it, transferring him to the virtual world where the Joker holds him hostage, giving him an edge over Batcode. As the code is destroyed he sends a command to Alfred to download another copy of the Batcode, which somehow fuses with the Joker Virus and sends them both into a…vortex of some kind…I’m still trying to figure out how Joker could mess with the sky when it isn’t virtual. This send Jim back into the real world…somehow…the mayor is hit with feedback…somehow…she tells Gata that she was actually a clone created to be a new body for the mayor after she became a cyborg but came to see her as her daughter and bankrolled her career before she dies…and yeah. The computers are back to normal and now man and machine can work together in harmony. And that’s the story. Also Gata and Jim are now a couple despite only knowing each other for a few minutes and she was upset that he touched her despite saving her from killers who wanted to kill her…for reasons. I have no idea what happened in the end and neither do the characters. And the sad thing I liked the story. Oh there are problems. You have gangs being semi-legal, a trope I tire of in these stories (see also the finale to Armageddon 2001), Jim just happening to have the old Batsuit that was given to his namesake grandfather was forced, and Jim gets a daughter that has so little presence she could have been a helpful neighbor and wouldn’t be missed. (Would she become Batgirl if there was a sequel? Couldn’t she have been Batgirl here? I didn’t buy that Mediaman was so far into the system that only Batcode could fight him instead of going right for the Joker Virus.) But there are some good concepts here, at least for the time. A Gotham run by a computer taken over by a Joker AI Virus. Batman creating a virtual doppelgänger to combat crime virtually. How Jim and Chang become Batman and Robin. Even Gata, who at one point is as naked as Moreno could get away with, had potential. And yet in the last chapter (this story was set up in chapters) the story goes wrong, like he was running out of time and/or pages and had to finish up fast. The ending doesn’t feel as good as it could be. The battle between virtual Batman and Joker, while possibly accurate, is boring, and the ending is very weak. Maybe that’s why I can find so little about this comic, which should have been a groundbreaker. For it’s time the combination of 2-D drawn images and 3-D vector images look good. The city comes off looking a bit like a circuitboard but given an AI computer code is running the city it makes a kind of sense. The back of the book has tech specs for the Batcraft, the Batsuit, and the Servos, character profiles that are meaningless at the end of the book but still interesting, and definitions for terms used in this story that get cut off partway through because you can’t scroll a window in a book but still give you the highlights. Chang has never shown up with other Robins, and there was a story in the tie-in to Batman: The Brave And The Bold that featured Carrie Kelley as a future Robin, but no sign of Chang. Despite being groundbreaking visually the story hits a few bumps until the final chapter, where it hits the wall, and it’s too bad. It was a good concept and nice visuals that suffered from a weak story. That’s always the one that bugs me, a good idea that deserved better. Posted by ShadowWing Tronix on February 24, 2017 in DC Spotlight, Scanning My Collection and tagged Batman, Chang Gordon, Computer-generated imagery, DC Comics, Jim Gordon (Batman), Joker (comics), Robin. 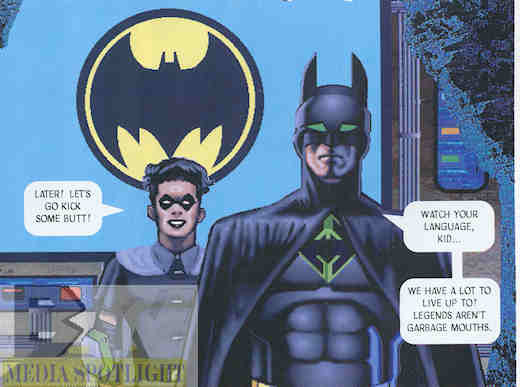 For 1990, this was pretty good of DC to imagine the future of technology in Gotham City. Also, your sharing of 80s technology memories sure shows how far technology has come. After all, this year is the 10th anniversary of the introduction of the I Phone.